By returning to the status quo, the show once again reduced Penny's identity to that of a single girl, making a fool of herself for men. 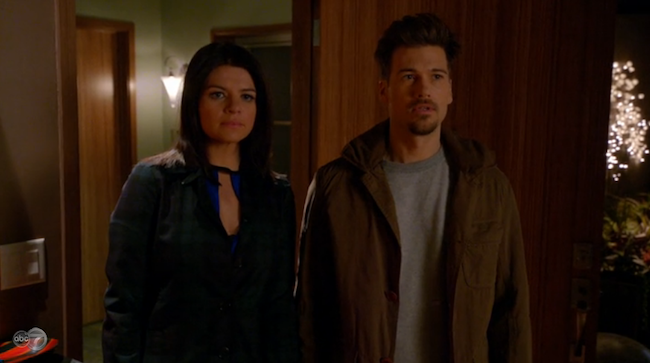 Casey Wilson as Penny and Nick Zano as Pete. I always assumed that Penny and Pete weren't actually going to end up married. Happy Endings is a show where character evolution happens extremely slowly, if it happens at all; Penny wasn't going to change overnight from an insecure single girl to a happily married woman in a stable relationship. And since Penny and Pete's breakup was inevitable, I'm glad it happened in the relatively low-key setting of "She Got Game Night," as opposed to the traditional disastrous wedding episode, which would have just rehashed the events of the show's pilot. Still, though, I really wish Penny and Pete had actually gotten married. Partially this is because I enjoyed Nick Zano's presence, which offered a laid-back counterpoint to the general insanity of the Happy Endings gang. Mostly, though, I like that Penny and Pete's relationship allowed Penny to break out of the desperate-single-girl role that has defined her character throughout the show's three seasons. As much as I love Happy Endings, I've always had sort of a hard time with Penny. There is no doubt that Casey Wilson is a gifted comedic actress - her genius for physical comedy alone is enough to brighten any scene in which she appears. Throw in the occasional spontaneous break into song and a penchant for ridiculous hijinks that usually involve Max (Adam Pally), and you have the makings of a great character. Pete's presence, not to mention his acceptance of Penny's general weirdness, allowed the character's crazy to come out in the form of over-the-top schemes (like the prank war in "The Marry Prankster") and desperate attempts to cover up mistakes (third-season highlight "Fowl Play/Date"), rather than her usual single-girl hijinks. Since Pete's departure, Penny's stories have once again returned to the well of single-girl desperation. She wrote a (terrible) musical about her relationship with Pete in "The Storm Before The Calm" and debased herself hooking up with Rob Corddry's Car Czar in "The Ballad of Lon Sarofsky." Neither of these episodes was bad - in fact, the Car Czar shenanigans were pretty damn funny - but they both represent a serious regression for a character who had finally managed to break out of her man-obsessed rut and devote her considerably craziness to better things. Of course, this is really all just nit-picking around the edges of one of the funniest, most delightful sitcoms currently airing (and hopefully continuing to air past tonight's season finale - get on the ball ABC!). If Happy Endings were any less hilarious, if the characterizations were just a bit less finely honed, and if the cast wasn't one of the best ensemble casts out there (they're probably tied with the cast of Community and the voice talent behind Archer in terms of current comedic gold), I wouldn't be complaining about a great character, played by a terrific comedian, not reaching her full potential. Here's hoping that the fourth season of Happy Endings (which will happen, because I will be so sad if it doesn't) sees Penny move beyond perpetual singledom in some way, whether that be through finding herself a good man or realizing she doesn't need one. Let's just hope that the end of Penny-the-single-girl doesn't come because she ends up with Dave. Nobody wants that. When it comes to fast remote control cars of this kind it isn't a case of filling the fuel tank and then racing them, you need to learn how to prepare them correctly first. Read this article and feel great.